Remember the ‘90s “Heroin Chic” trend? (Think Kate Moss). That was kind of weird, but it turns out society has been fetishizing and glamourizing illness and entwining it with women’s beauty ideals for centuries. In 1849, Charlotte Brontë wrote “Consumption, I am aware, is a flattering malady.” The symptoms of consumption, otherwise known as tuberculosis, the disease that caused 25 percent of deaths in Europe between 1780 and 1850, were chic AF. A slight flush, glassy eyes, thinness and pale skin were idolized qualities in women and coincidentally also turned out to be symptoms of the chronic low-grade fever that accompanies tuberculosis. Super glam, right? Now I won’t delve into it, but beauty ideals and women’s expected roles and suppression in society tend to go hand and hand. (Interested?! I personally think The Beauty Myth by Naomi Wolf should be required reading!). So – what’s in now, beauty-wise? In what I’d call a positive turn of events, thanks to skin care obsessive geniuses over in South Korea – glass skin is the next thing. 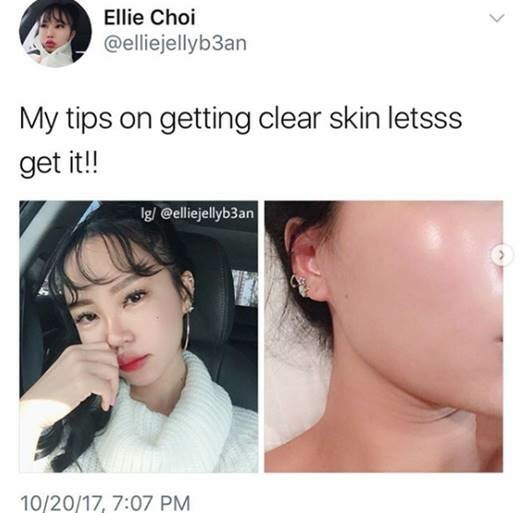 A slight deviation from honey skin, glass skin (according to Allure) is a complexion that “boasts an otherworldly, almost translucent glow that mimics the appearance of (hold your breath) glass.” From k-pop stars to bloggers and internet beauty gurus – glass skin has arrived and I am 100% down for it. Why? While it may not be entirely realistic, glowing, luminous and plump skin are all things attributed to good health and self-care. No sagging cheek bones, sunken eyes or anything heroin/illness related here – just health. I’d like to think that the glass skin trend reflects the times. Society doesn’t want women to look sick and unhealthy, but glowing and ready to kill it. Final verdict: TBD on the trend, but you can catch me hitting “add to cart” on Soko Glam with some BTS playing in the background, in the meantime!